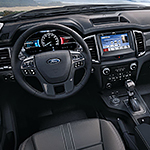 The Stylish and Versatile Ford Ranger | Dean Arbour Ford of West Branch Inc. When looking at a pickup truck with style, the new Ford Ranger is the vehicle that is picked as an example. However, there is more to the style of the Ranger at Dean Arbour Ford of West Branch than just the appearance of the vehicle. For one thing, the truck has other features that actually make it quite versatile. While you can look at the dome hood and low-angled windshield as an example for style, there are other features such as the rounded wheel arches. Then you have the interior features such as the comfortable seats and the 8" center touchscreen. The major star feature of this vehicle is the ability to be versatile. You can actually choose the type of seating arrangement you want with the Ford Ranger. You can choose either the SuperCab or the SuperCrew. This gives you control over how many people you are going to be able to ride.